As the famous saying goes "Chess is 99% tactics." What are chess tactics? Tactics are maneuvers that take advantage of short-term opportunities, often (but not necessarily) involving combinations or sacrifices. 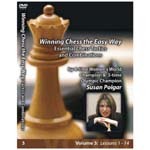 In this DVD, Susan will introduce the most common tactical elements in chess.